The Center for Expressive Technologies tells the story of Cal Poly’s excellence — using everything from a digital app to community-wide exhibitions to showcase students’ creativity. 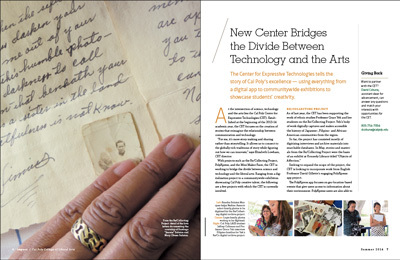 At the intersection of science, technology and the arts lies the Cal Poly Center for Expressive Technologies (CET). Established at the beginning of the 2013-14 academic year, the CET focuses on the creation of stories that reimagine the relationship between communication and technology. “For me, it’s more story making and sharing rather than storytelling. It allows us to connect to the globally rich traditions of story while figuring out how we can innovate,” says Elizabeth Lowham, CET director. With projects such as the Re/Collecting Project, PolyXpress, and the Mini Maker Faire, the CET is working to bridge the divide between science and technology and the liberal arts. Ranging from a digitalization project to a communitywide exhibition showcasing Cal Poly creative talent, the following are a few projects with which the CET is currently involved. photos to be digitized for the Re/Collecting digital archive project. 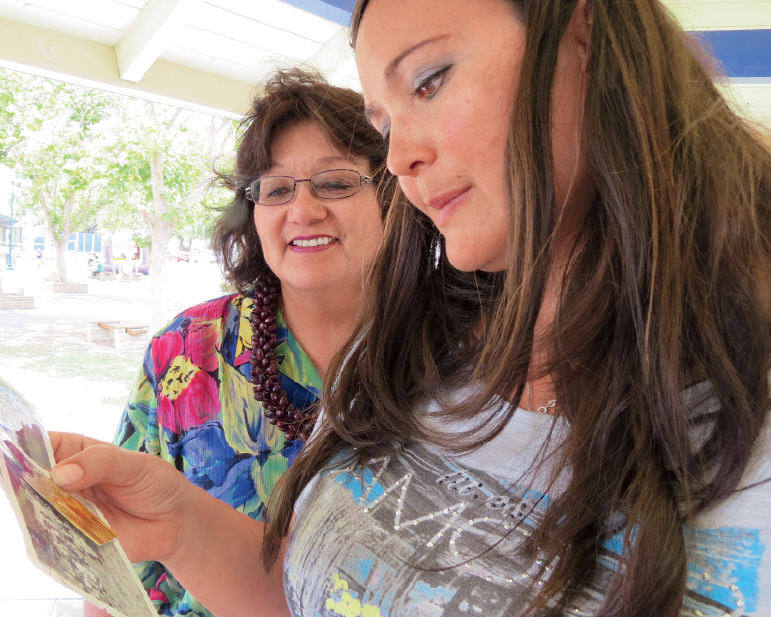 As of last year, the CET has been supporting the work of ethnic studies Professor Grace Yeh and her students on the Re/Collecting Project. Yeh’s body of work digitally captures and makes accessible the history of Japanese-, Filipino- and African-American communities from the region. Seeking to expand the scope of the project, the CET is looking to incorporate work from English Professor David Gillette’s engaging PolyXpress app project. The PolyXpress app focuses on geo-location-based events that give users access to information about their environment. PolyXpress users are also able to upload their own images, text and video, allowing them to create and share their own stories of place and meaning while encouraging interaction with physical locations. Collaborating with the Creative Industries Division at the Queensland University of Technology (QUT) in Brisbane, Australia, Gillette is preparing a series of workshops that will help QUT students interact with the PolyXpress mobile storytelling system and help the Australian aboriginal communities present their traditions, stories and culture, including the hidden stories of the land beneath modern Brisbane. The CET and the Liberal Arts and Engineering Studies (LAES) Program will work with Gillette to produce lectures, facilitate joint training sessions, and discuss storytelling ideas through live video sessions. Technology, in Australia, to develop the potential of the platform. Expanding the scope of how and where the PolyXpress app could potentially be used, the center is hoping to use the app to enhance appreciation of Cal Poly’s campus. Lowham and Michael Haungs, LAES co-director and associate professor of computer science, are applying for a grant to create a PolyXpress story about the Cal Poly Arboretum. Working with Chris Wassenberg, the Horticulture & Crop Sciences Department, and students in the colleges of Liberal Arts; Engineering; and Agriculture, Food & Environmental Sciences, this PolyXpress story would allow visitors to learn the history and facts connected to individual locations within the arboretum, as well as the rich resources and history of the Leaning Pine Arboretum. 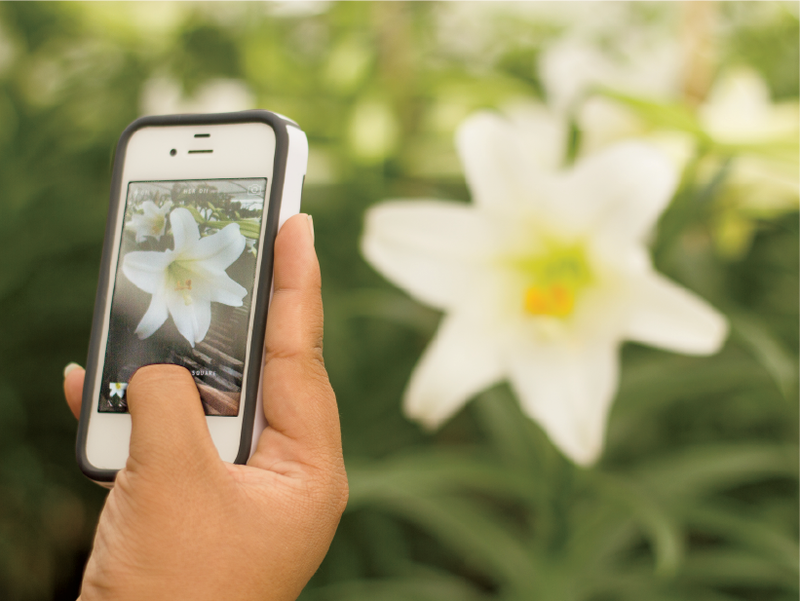 Visitors would also be able to use their mobile phones to upload images and text for other app users to view. Though both PolyXpress-related projects are still developing, Lowham hopes these projects will serve as examples of the possibilities that new technology and science can open up for storytelling. “Technology has expanded the art of story making — it has expanded access to sharing stories, expanded mediums through which we construct stories, expanded the creation of story, and expanded what we mean by story,” Lowham says. Model of "Plug-in Pavilion" from the Mini Maker Faire. The CET is focused on not only exploring the technology-liberal arts relationship but also helping to build community based on the actual sharing of stories. A visual representation of this idea was realized at this year’s Mini Maker Faire. Lovingly described as the “Greatest Show (and Tell) on Earth,” the annual Mini Maker Faire places emphasis on the creative process rather than on the finished product. The event creates a time and space for local inventors, artists, scientists, thinkers, storytellers, engineers and learners to share their passions and ideas. 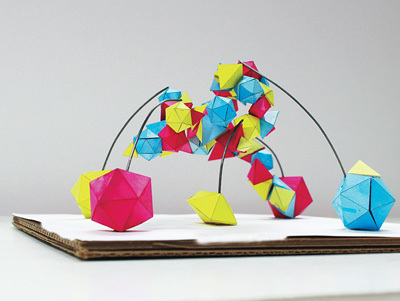 The May 10 fair featured a student-designed centerpiece called “Plug-in Pavilion,” which included geometric shapes that changed as the event progressed. “The students who conceptualized the structure wanted to create ‘a space that is literally created by the stories people share,’ ” Lowham says. The CET has also collaborated with different entities to help bring new opportunities to students on campus. Opportunities included a screening in collaboration with the San Luis Obispo International Film Festival and assistance with the 2014 Cal Poly Design & Dev Hackathon — an event that encourages students to pool their creativity and entrepreneurial spirit to develop projects within a 12-hour period. “With the CET, we’re working to forge new internal and external relationships that benefit students, faculty and the broader community,” Lowham says. As the CET nears its one-year anniversary, plans are already in the works to round up new projects, finalize new partnerships, and solidify the center’s image. Even with the emerging push to connect technology with the liberal arts, there are still some things that will always remain the same: creating value through meaning and forming relationships. Download a pdf of the full IMPACT magazine.